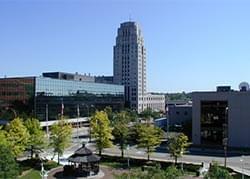 All-Pro Mechanical is proud to serve the Battle Creek community! About Battle Creek, MI - Happy to be your hometown Heating & Air Conditioning Contractor! Battle Creek is a city located in Calhoun County, Michigan, and as of 2010 the population was about 52,000. It is also known as â€œCereal Cityâ€ since it is home to the international headquarters of Kellogg Company. Several popular festivals are held in this city, including the International Festival of Lights and the Worldâ€™s Longest Breakfast Table. The weather of this area typically consists of hot and humid summers. Winters are cold, and moderate to heavy snowfall can be expected. There are several attractions in Battle Creek that might appeal to visitors and residents alike. The Binder Park Zoo is a great place to spend the day with the family, while golf lovers may enjoy a trip to Binder Park Golf Course. Other historical and specialty sites include the Dr. John Harvey Kellogg Discovery Center and the Kingman Museum. Visitors looking for an amusement attraction may wish to check out Full Blast when traveling with their children.